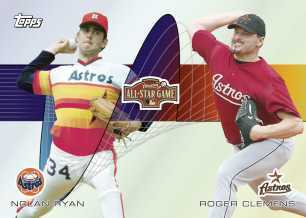 Topps has created three unique Houston Astros baseball cards to commemorate the upcoming 2004 MLB All-Star FanFest in Houston, TX. Each of the three cards is available only at the Topps Booth via wrapper redemption. Any collector opening five super-premium 2004 Topps/Bowman branded (products TBD) baseball packs at the Topps Booth will receive an exclusive Lance Berkman Relic Card featuring a piece of his game-used jersey (home-pinstripe). And collectors opening any five 2004 Topps/Bowman branded baseball packs at the Topps Booth have a choice of either an exclusive Nolan Ryan/Roger Clemens dual card or an exclusive Roy Oswalt card. All three cards are featured in Topps Finest technology and include the 2004 MLB All-Star Game logo on the front of the card. And each has been created exclusively for the 2004 MLB All-Star FanFest. Stay tuned for more news regarding the Topps Booth at the 2004 MLB All-Star FanFest!